So many factors went into the Tigers running away with the AL Central last year, you couldn’t possibly track them all. Justin Verlander was the best pitcher in the league and Miguel Cabrera might’ve been the best hitter. Jose Valverde didn’t blow a save all year. Doug Fister was often unhittable after coming over in a deadline trade from Seattle. Breakout seasons for multiple supporting cast members and a down year for the rest of the division shoved Detroit to a 95-win season and a breezy division title. That 95-win team goes into the offseason as prohibitive favorites to repeat as division champs. It spends $214 million on Prince Fielder to make absolutely sure. It’s a lock, right? If only baseball math were that easy. The Tigers’ 2-1 loss to Cleveland Thursday dropped them to 20-24 for the year, six games behind the surprise Indians. The team many considered the biggest playoff lock of the 2012 season now needs a hot streak just to make it back to .500. One of the biggest culprits for Detroit’s struggles has been the most predictable one: lousy team defense. Only the Mets have been worse defensively this season, per Ultimate Zone Rating. UZR is subject to a few problems, starting with making too big a deal out of a quarter-season’s worth of defensive results. 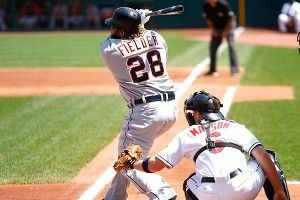 Still, a roster full of no-glove options was rendered worse defensively when Jim Leyland curiously decided to play noted butchers Miguel Cabrera and Prince Fielder every day as corner infielders. Cabrera hasn’t been quite as atrocious as you might have expected after converting back to third base following years away from the position, then taking a ground ball to the face early on (on a very sharply-hit ball, it should be noted). But both no-glove sluggers have still been bad enough, with the Tigers getting a collective sub-.600 OPS from its designated hitters thanks to Delmon Young’s lousy year and some curious choices to start at DH the rest of the time. But there were plenty more reasons to fear regression for the Tigers, despite the 95 wins+Fielder=Profit(?) formula. Alex Avila and Jhonny Peralta hit out of their minds last year, and were prime bets to pull back in 2012. Valverde going unblemished all year long in save opportunities wasn’t going to happen again even if the Tigers moved to the Sally League. Even the seemingly loaded 2011 Tigers weren’t necessarily 95-win quality by at least one metric: Their runs scored and runs allowed totals suggested an 89-win club. only to have Manny Acta wave him back off the field, to the amusement of everyone in the mound huddle. A Cabrera flyout and Fielder tap back to the mound extinguished that threat too, and the Indians went on to complete the three-game sweep over Detroit. But there are still reasons to worry. The Tigers’ best hitter this year, Austin Jackson, just hit the disabled list. They lack major league-ready impact prospects at their weakest positions. And perhaps most of all, they’re chasing a pretty good team. The Indians have reaped solid-to-great production from young stars Asdrubal Cabrera, Carlos Santana, and Jason Kipnis, Travis Hafner’s healthy and getting on base a ton, and Shin-Soo Choo is finally returning to pre-2011, hitting a ton in his recent move to the leadoff spot. Cleveland’s Bullpen Mafia, led by strikeout machine Vinnie Pestano and whipping boy closer turned attendance complainer turned standing ovation receiver Chris Perez is pitching the best ball of his career, striking out nearly three men for every one walk, and yielding just three extra-base hits in 19 1/3 innings. A 10-2 record in one-run games and the run differential of a .500 club suggests the Indians might be a bit lucky to be sitting at 26-18, with the 5th-best record in baseball. But that six-game bulge over Detroit is banked, and the stars-and-scrubs Tigers roster might need multiple in-season moves to paper over their weaknesses.